The Pinotage is hand harvested in small lug boxes and crushed into large open top barrels where regular punch-downs are done. A small percentage of the berries remain in tact. Additions are limited to a minimum and native yeasts conduct the fermentation at a gentle pace. After fermentation the wine is siphoned into inert barrels and the skins are gently pressed in a basket press. Fresh nuances of red currant and dark plum on the nose and fine, ripe tannins combine in a balanced, concentrated wine with a lingering finish. Including delivery to major centers in South Africa. 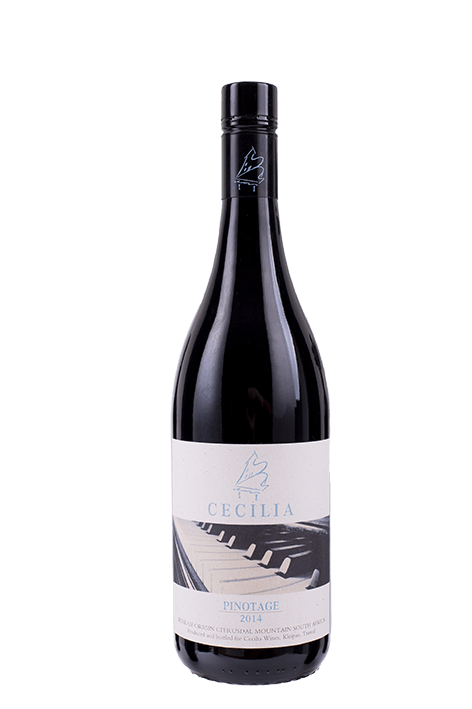 Because of the old age of the vines, volumes are very limited so if you want to secure at least 6 bottles of Cecilia each year for yourself, why not become a friend of Cecilia? Apart from receiving 6 very rare bottles of Pinotage each year, you will also receive personalised updates on our progress and will of course qualify to buy tickets for the best seats in the house when that next concert happens! If you would like to get involved on a different level, by for example donating music instruments, please contact me for more information about the Non-Profit Organization, Cecilia Foundation.